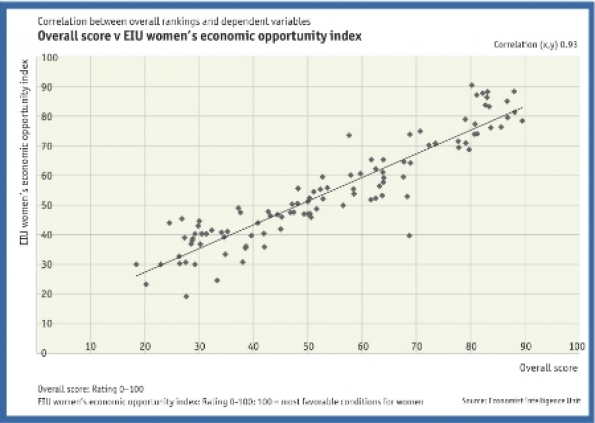 New research from the Economist Intelligence Unit uncovers a strong correlation between women's economic opportunity and the access to affordable, safe food. We all know that correlation does not mean causation, but it is pretty darn interesting to see that the two are so closely related. The full data is available at a special website hosted by the EIU and DuPont and features an interactive visualization of what was captured. Among the other interesting findings are that landlocked countries show only a modest increase in food insecurity, on average seven points lower on a scale to 100. Also, the country that had the least annual volatility of farm output over the past 20 years was China (explained by generous subsidies that create a floor for food commodity prices), while the North African countries of Morocco, Tunisia and Algeria had some of the most variance. The good news is that several of the countries at the very bottom of the index, notably Mozambique, Ethiopia, Rwanda and Nigeria, are also ones with strong economic growth, suggesting that their food situation may improve as living standards rise and as sound policies are hopefully put in place.